Softonic, one of the world's leading download sites, cooperating in Germany, among others, with the Frankfurter Allgemeine Zeitung and the Süddeutsche, recently tested the RarZilla-engine. 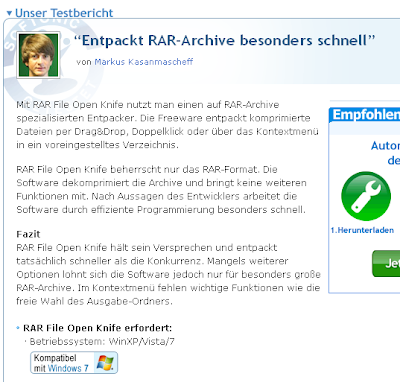 The editors from softonic.de tested the program "RAR File Open Knife", that uses the RarZilla-engine as a centerpiece. After careful testing of the unpacking engine, the outstanding result is confirmed: Softonic editor Kasanmascheff writes in the conclusion of the test report, "RAR File Open Knife keeps its promise and unpacks actually faster than the competition". Consequently, the other two RarZilla-products, "Free RAR Extract Frog" and "RarZilla Free Unrar", that are using the same unpacking engine as the core, can also claim the label "faster than the competition" for themselves. Softonic editor Harbauer even demands for the tested program "RAR Open File Knife": "This must be on the computer". In his blog post he writes: "To unzip, you do not necessarily have to rely on WinRAR: RAR File Open Knife is a free and easy alternative. Although RAR File Open Knife only supports that one format - in most cases that is sufficient... "